We focus in our European training room on little games and exercises which combine football with language learning. These games recall traditional street games and may be used in guided training sessions as well as by the children among each other. The rules of the exercises are simple. The innovative aspect of the sessions is to use the foreign languages. The children will grab up the foreign languages quickly when they need to use it together with their football skills. Receiving and controlling the ball. Throw-in, basic technique, ball control. Throw-in and finishing by header. Basic technique and ball control. Header and finishing by head. Speed, swiftness of reaction and orientation. Dribbling, swiftness of reaction, orientation. Coordination, swiftness of response, speed. Dribbling in various directions and speed. Receiving and controlling the ball. We form pairs of players. Each pair has one ball. One player throws the ball with the hands onto the ground that it bounces to the opposite player. The throwing player shouts how the receiving player needs to control the ball and how many contacts he has to play the ball back. Example: breast 3 = player stops ball with the breast and after 3 contacts (breast, knee, foot) he plays the ball back. Contact 2 and 3 are free to be chosen. The receiving player stands with the back to the throwing player. Orientation. 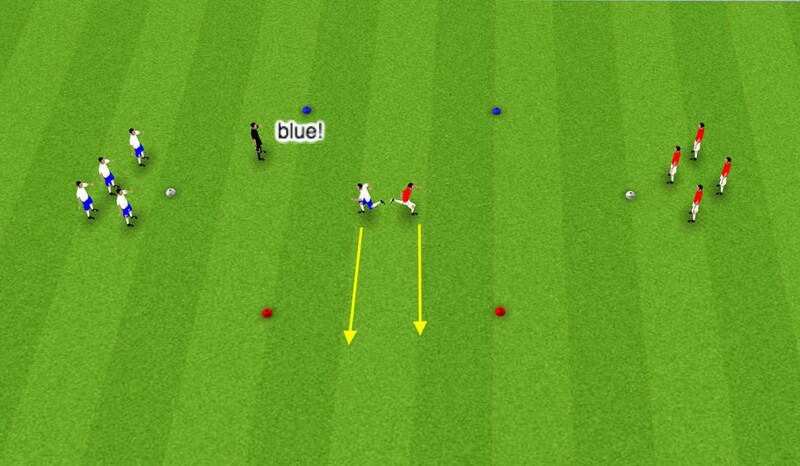 We set up a pitch with cones in 2 colours (red / yellow). We form 2 teams (red / white). The white team defends the yellow cones, the red team defends the red cones. We give both teams 30 seconds time. The aim is that each teams overturns the cones of the opposite team and stands up their own overturned cones again. Who has more standing cones after the game is the winning team. Passing, shooting on target. We set up a pitch and place various cones across. 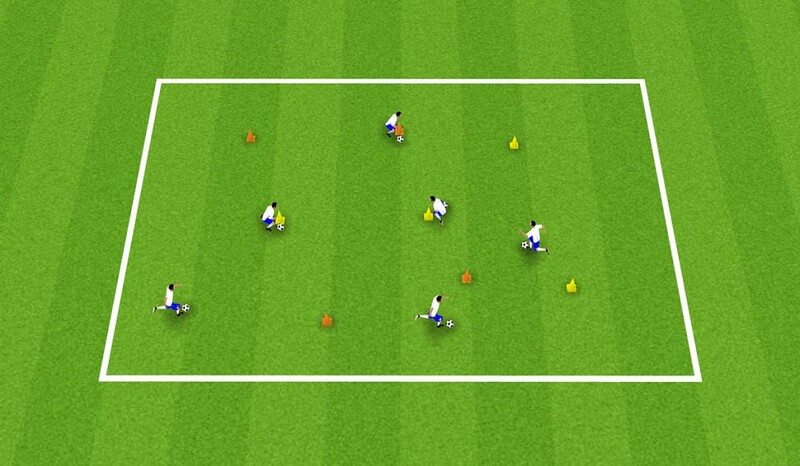 The players dribble the ball and need to shoot on the cones and try to hit them so that they fall over. Important is the accuracy of the pass / shot, not the power. We can give instruction that only red or yellow cones may be hit. We should use different body parts for passing / shooting – inside, outside, left foot, right foot etc. Dribbling and coordination. We set up a pitch and place some cones. Each player gets a ball and dribbles the ball individually across the area. The player heads to a cone and touches it. When he is touching the cone, he shouts with which body part he has touched the cone (i.e. left hand, right foot, knees, head etc.). Small-sided games. We set up a pitch with 4 goals. Each goal gets the name of a country. We play 5v5 or 4v4 (according to numbers of players). The task is the following. The team with the ball tries to keep the ball in their team. They need to play a minimum of 5 passes. The coach or neutral player says into which goal the team needs to score. 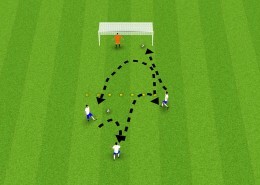 See here example: coach shouts Germany, white team needs to score after 5 passes into goal Germany. Agility. We form 2 groups of players. 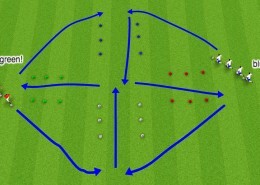 One player of each group moves to central cone (green) and keeps moving (skippings). 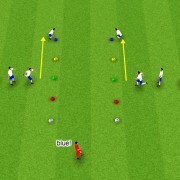 Coach or neutral player shouts a colour and players need to move their in sideward steps as fast as possible. When they reach the targeted cone they need to kneel down. We can move the starting point from the central cone to other cones. Try to variate on distances to cover. Also change the pairs that different players compete with each other. Instead of kneeling down, players may lie down. Receiving and controlling the ball. We form pairs of players. One player stands in a marked square. First player plays a pass on the ground and gives instruction in which direction 2nd player needs to take the ball under control. The 2nd players takes the ball under control as advised (here: to the right or backwards) and plays the ball back. After 5-6 passes we change roles. Throw-in, basic technique, ball control. We set up a bouncing wall. The group of players stand in a row, each has a ball. The first player is throwing the ball on the wall and runs to catch it. The next player behind him gives instruction how to receive and control the ball (head, breast, right foot etc.). The 2nd player throws the ball and the next player behind him gives instruction how to receive the ball. Etc. The 2nd player throws the ball on the wall and 1st player needs to receive it. Throw-in and finishing by header. We set up 2 groups. 1 group is behind the goal and throws the ball in over the goal. The other part of the group waits in front of the goal behind the white line and tries to score a goal by head. The player who throws the ball gives instruction in which direction to score and how many contacts to use (one, two, three). Basic technique and ball control. 4 players play on 1 goal, 1 player is goalkeeper. The other 3 players need to keep the ball up and pass the ball to each other. The number of contacts is unlimited. Yet, the ball must not touch the ground. After 3 passes, the players are allowed to shoot on the goal from behind the red line. The shot on target must be volley. If a player does not score, he becomes the goalkeeper. If the player plays the ball on the ground, he becomes the goalkeeper. directions in shooting on target may be given in foreign language. Players may agree in foreign language how to play and score (shooting right foot, left foot, header). Header and finishing by head. 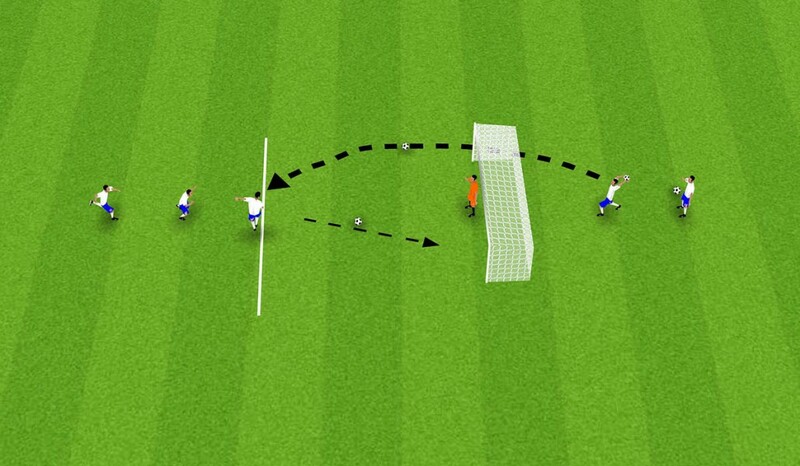 We set up a pitch with a goal, goalkeeper and a red line 6-7 meters in front of the goal. We form pairs of players. 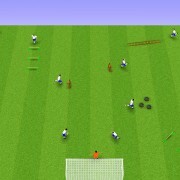 The players pass the ball by head between each other. (If players struggle to pass by head, one player throws the ball by hand). At the red line the player tries to score a goal by head. 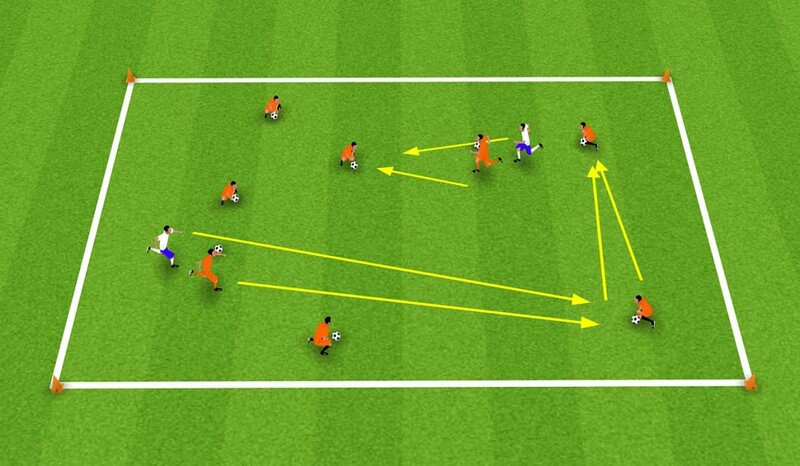 The passing player gives instruction in which direction they try to score (up, down, left, right, centre). Coordination playground. 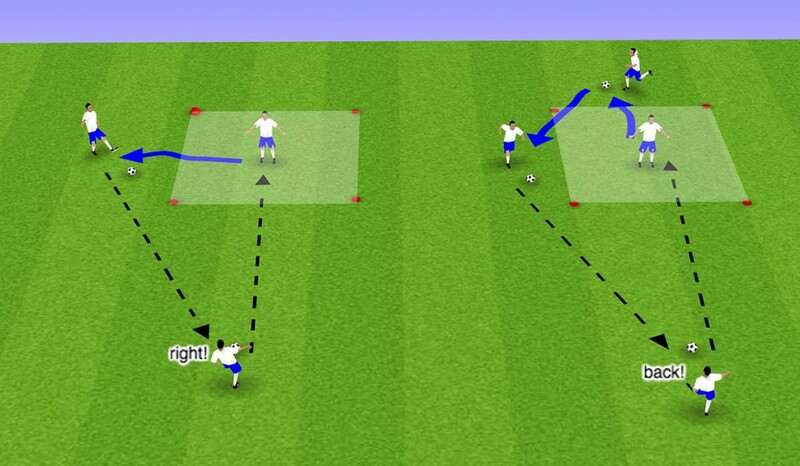 Different to other coordination drills, this exercise is not organised by the coach with precise tasks. We set the exercise up as an open playground. The players are free to choose which coordination point they want to try out and how long they would like to stay there. When the players have finished with one point they may move to another point or make a short break. The coordination points may be used individually or in groups. Dribbling and orientation. 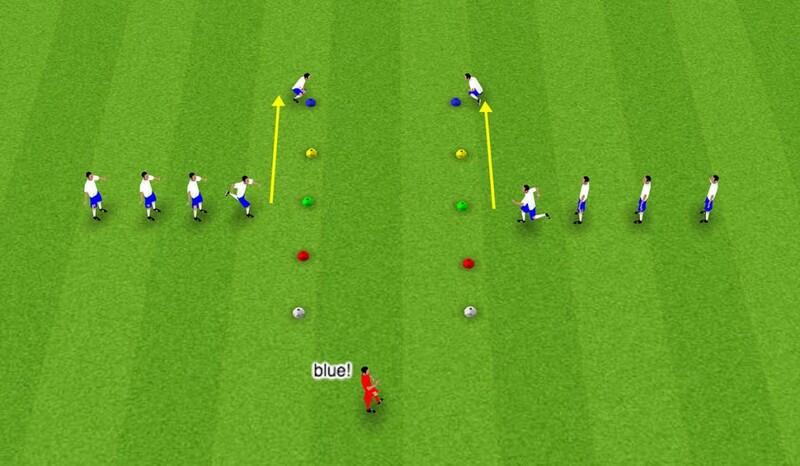 We set up a pitch with corridors in different colours (marked by cones). We form two teams, red and white. Each player has one ball. Both teams start to dribble in a row (all players behind each other). They dribble in a big circle around the corridors. The last player in the row gives instruction into which corridor the team shall dribble. 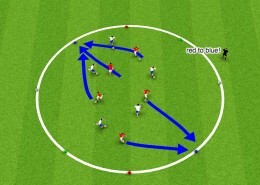 Example: last player in white team shouts “blue-red” and his team dribbles into blue corridor, then into red corridor. Last player in red team shouts “white-green”, reds dribble into white corridor, then green corridor. Afterwards they go on dribbling in the circle. Last player gives more complicated instruction with several colours (“blue-red-white-red”). Last player should change that each player gives instructions. Speed, swiftness of reaction and orientation. Two players are selected as catchers (in white). They chase the running orange players (each orange player carries a ball). The chased players may kneel down next to another orange player. Then the other orange player is chased. The orange players communicate directions in foreign language. “come right, run back, go left…”. Another variation can be that all players (orange and white) dribble the ball on the foot. 1v1. We set up a pitch with 4 goals and form 2 teams. 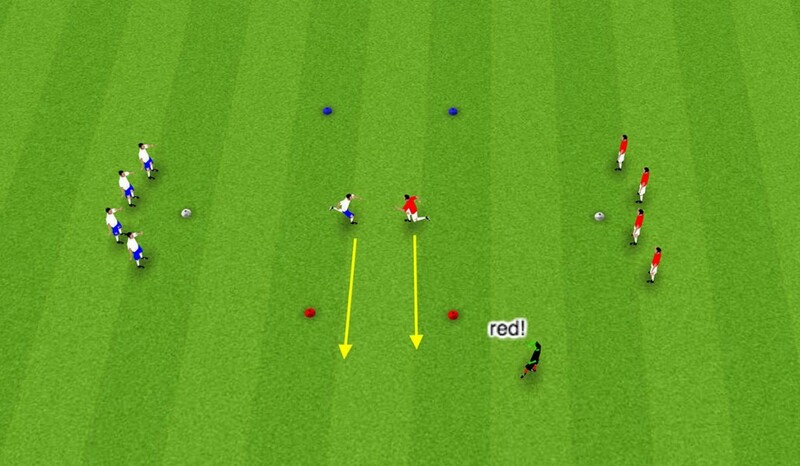 Red player has ball and passes the ball to the opposite white player. White player receives the ball and goes into dribbling. He needs to score a goal on the red side. After the pass, the red player needs to defend and goes into 1v1 battle. 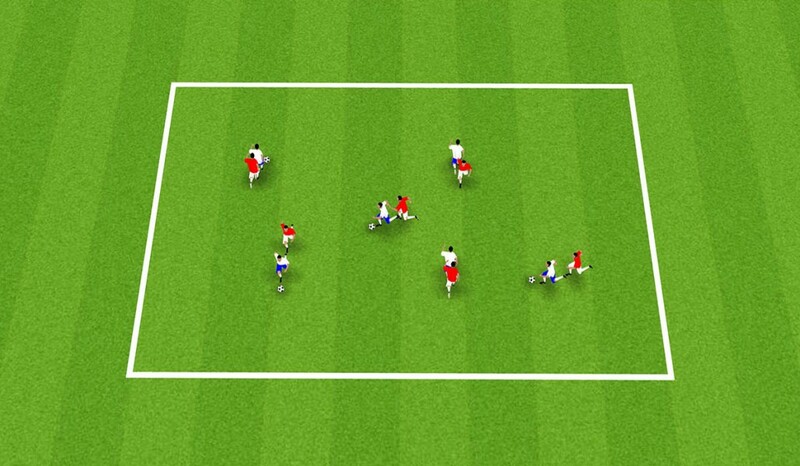 If red player catches the ball he may score a goal on his own. After some time roles between red and white change. Swiftness of reaction, coordination. We form pairs of players. White player has the ball and throws it to the red player. He gives instruction how the red player needs to return the ball – by hand or head. After some time we change roles and red player throws ball to white player giving instructions. We use other body parts (knee, foot). Do not use more than 2 body parts at the same time. Further variation: use the opposite sense of the words. Example: On instruction “head”, you need to play with the knees. Dribbling, swiftness of reaction, orientation. We set up a limited area with cones in different colours on the edge. We form 2 teams, each player gets one ball and all are dribbling. The coach gives instruction to which cone which team should dribble. 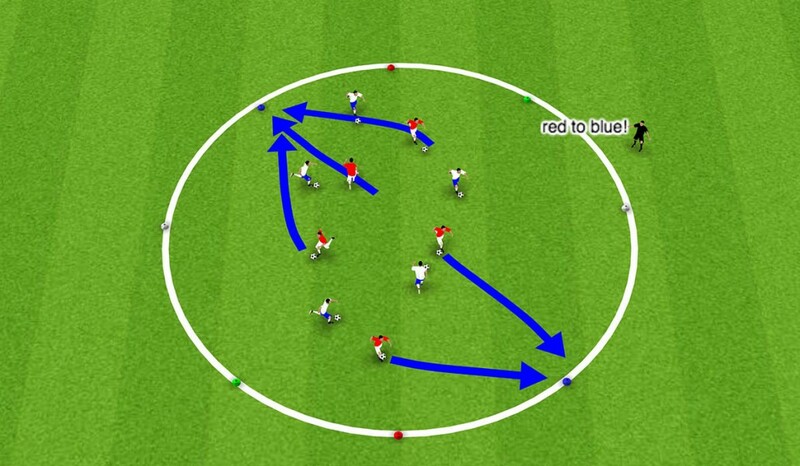 Example: coach shouts “red to blue” and all red players dribble to blue cones. Variation of area (can be circle, square, smaller area, bigger area). Variation of cones (can be shirts with numbers, objects in the environment (goals, trees, gates, stones, rubbish bins etc.). 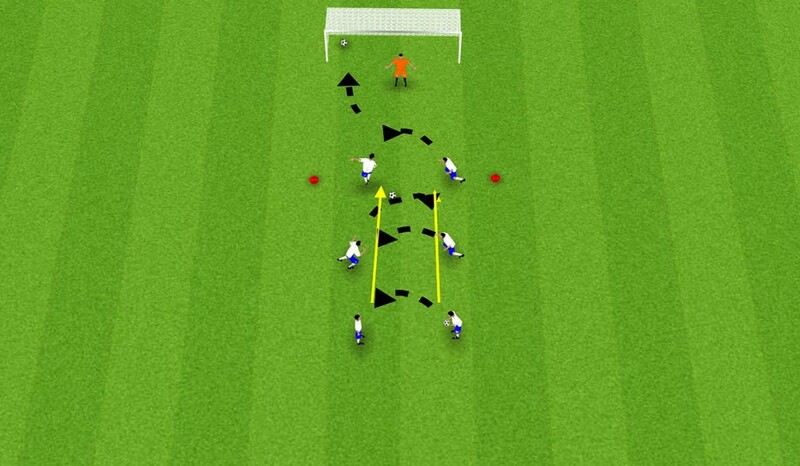 Variation of tasks: example: dribble, juggle the ball twice, dribble to the cones. Coordination, swiftness of response, speed. 1v1, both players meet in the middle back to back (skipping). Coach gives instruction in which direction to run. If coach says blue, players need to run to red and vice versa. 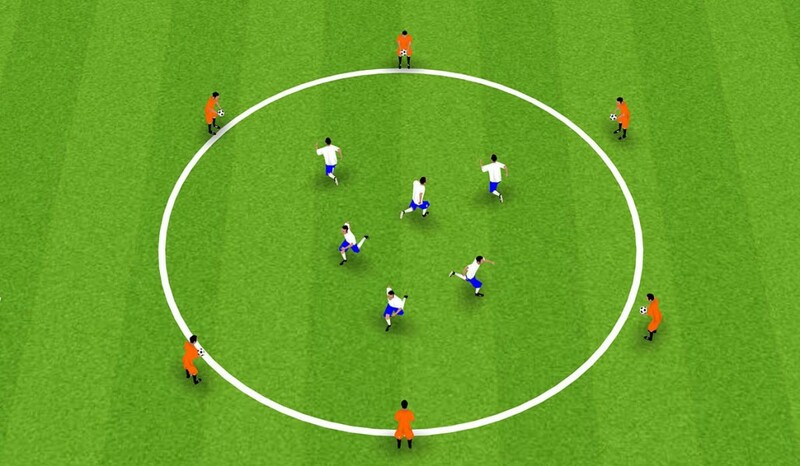 Players may vary position – on the knees, standing on one leg, lying down, sitting etc. Mix the pairs that not the same players compete with each other all the time. Use new cones and colours. Speed and reaction. 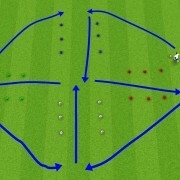 1v1, both players meet in the middle in movement (skipping) Coach gives instruction in which direction to run. Instruction is done by name of colour (blue or red). If coach says blue, both players run through blue goal. First player crossing the goal wins. Then the next 2 players come to 1v1 in the middle. Again coach sends them into direction red or blue. New colours with new cones. Sense of colour and direction can be changed. 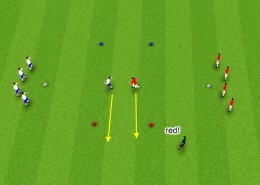 On “red” players need to run to blue cones etc. Dribbling and passing. 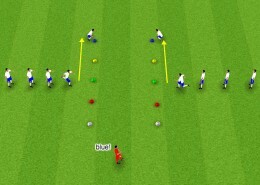 Player A passes to B and B shouts to A around which cones he needs to run (red, blue, green, white – see cones in corners). It is important that pitch is not too large. Most important is quick orientation not the distance to run. Many chances to variate on. Cones need not to be in corners, they may be on lines. More cones may be placed. 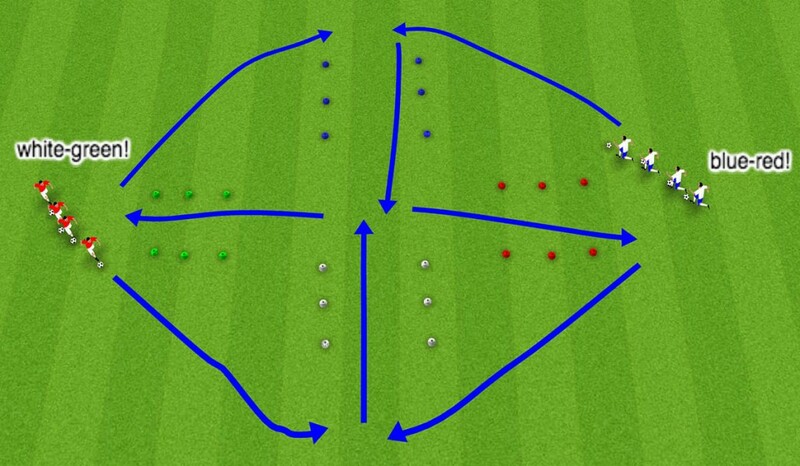 Variations may be also directions how to run to the cones (running straight, skippings, running sidewards etc). Dribbling in various directions and speed. We form pairs of players. Red chasing white (or white chasing red). Red gives instruction how and where white player should move (right, left, straight, zic-zac, slow, fast, stop etc.). Red and whites change role after some minutes. If players are talented, both players may get a ball and follow each other. We always play with 2–3 contacts. Players from outside shout how first contact should be – “head”, “breast”, “right foot”, “left foot” etc. 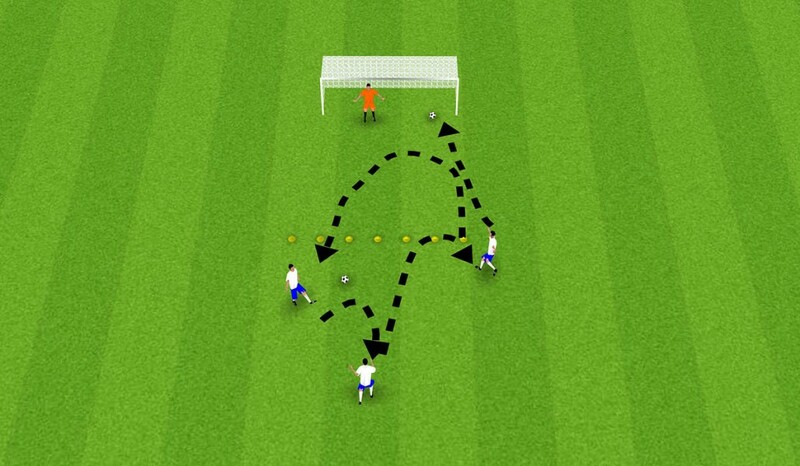 Players catch the ball, control it and play pass back to the player who threw the ball. It is very important that coaches pay attention that all body parts necessary in football are used (hands not allowed). Short turn of player when he controls the balls and plays pass to next free player (not player who threw the ball). We create 3 teams – red, white and orange. In the orange team (off the pitch) each player has one ball. The orange players try to throw the ball to a white player who would need to pass the ball back. The red player needs to interfere into this action and catch the ball with his hands. Important will be that we rotate the teams (first orange are off the pitch, then white, then red). The players throwing the ball can shout the body part how the ball needs to be returned (“head”, “foot”, “knee”, “left foot”, “right foot” etc.). 6v6 on 4 goals (game handball – header). Aim is that players communicate among each other. Before players play a pass among each other they need to shout the name of the team-mate who is supposed to get the next pass. Opponent is not allowed to attack the player directly, but may only block or catch the pass. Goals may be scored by header only. Depending on number of players we can make pitch larger or smaller. If players are very good, you may try football instead of handball.